The Ultra-Cut® XT technology provides the next generation of higher productivity, increased flexibility and confidence in high precision plasma cutting. Ultra-Cut XT systems give the flexibility to increase cutting power and the assurance of superior quality, higher productivity and lower cutting costs. 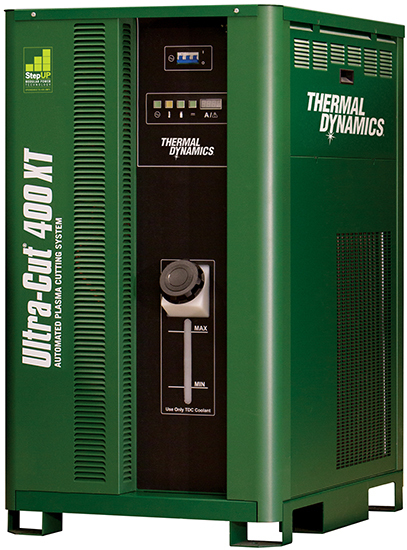 Ultra-Cut XT systems are available in 100 to 400 Amp outputs for cutting plate up to 2" (50 mm) thick. Their performance will meet or beat anyone on mild steel, and they are superior on non-ferrous metals. With the Ultra-Cut XT, you never have to worry about choosing the right system. The next generation of high precision plasma cutters works the way you do — intelligently. Ultra-Cut 100 XT Mild Steel .75 in. Ultra-Cut 100 XT Stainless Steel .75 in. Ultra-Cut 100 XT Aluminum .75 in. Ultra-Cut 200 XT Mild Steel 2.5 in. Ultra-Cut 200 XT Stainless Steel 2 in. Ultra-Cut 200 XT Aluminum 2 in. Ultra-Cut 300 XT Mild Steel 3 in. Ultra-Cut 300 XT Stainless Steel 2 in. Ultra-Cut 300 XT Aluminum 2 in. Ultra-Cut 400 XT Mild Steel 3.5 in. Ultra-Cut 400 XT Stainless Steel 4 in. Ultra-Cut 400 XT Aluminum 3.5 in.